Lincoln City was originally five separate communities. This is the third in our series focusing on one of these – Taft. Discover its fascinating past and why it makes Lincoln City such an interesting place to visit today. European immigrants appeared in the area in 1894 when North Lincoln County allowed settlement. It began as a small trading and social center for homesteaders living in the isolated area. Homesteaders often traveled by water to patronize the waterfront stores. Allotments ran along the north end of Siletz Bay that bordered the open ocean, now 49th and 51st streets. The waterfront eventually earned the nickname “Taft Flat”, and was a popular place for get-togethers and camping. To say the village grew slowly would be an understatement. By 1904, there was only one house and commercial ventures. In 1906, Taft earned its official name with the addition of a post office honoring President William Howard Taft, Theodore Roosevelt’s secretary of war. Retail, the post office, and fishing and logging were the only noteworthy concerns in the area for the primarily Finnish residents. This small settlement nestled on the floodplains of Schooner and Drift Creeks grew very slowly until the Roosevelt Military Highway (Highway 101) opened in the 1926. It opened the area to tourism and linked once remote communities along the Oregon Coast. Almost overnight, everything changed. Trade moved away from the waterfront to the highway to accommodate automobile traffic. A covered bridge at Schooner Creek welcomed motorists to Taft from the north. Promoters advertised Taft as the ideal destination for a holiday and a picturesque place for a vacation home. A small economic boom ensued and the once sleepy town became a resort community for motorists. In 1949, Taft officially became a city with a population of 498. However, the city teemed with tourists and lodging to accommodate them. The first was The Pines Hotel with a ballroom and restaurant. Later, 91 tourist cabins and two trailer courts joined the ranks on or near the waterfront. A few of the cabins can still be seen in the southern end of Lincoln City. However, most cabins disappeared when hotels and state campgrounds appeared in the area. Today, the Taft archway adorned with Dungeness crabs marks the entrance to this historic waterfront area. 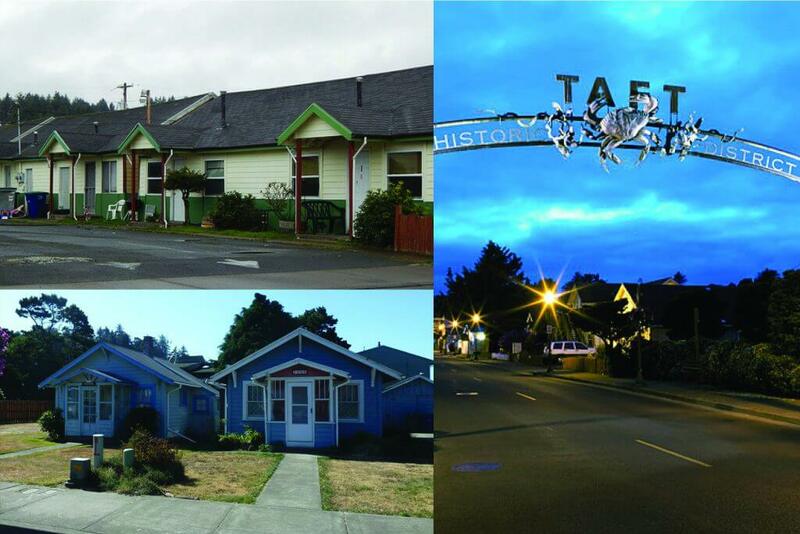 Taft, along with 4 other districts became Lincoln City in 1965. The business district remains, with art studios, coffee and pastry shops, restaurants, and shopping. It is still a popular tourist destination, because it offers unparalleled Oregon Coast beaches, surfing, and pristine tidal pools and wildlife. The oceanfront is ideal for whale watching, digging for clams, or trapping crab. Some of the historic buildings still stand in the area. If you’re interested in exploring historic Taft, why not stay in a comfortable Lincoln City oceanfront rental with stunning ocean views and high-end amenities. These well-appointed condominiums offer space and comfort at a very affordable price.